Mary and Joseph are here for the Presentation of the child Jesus. 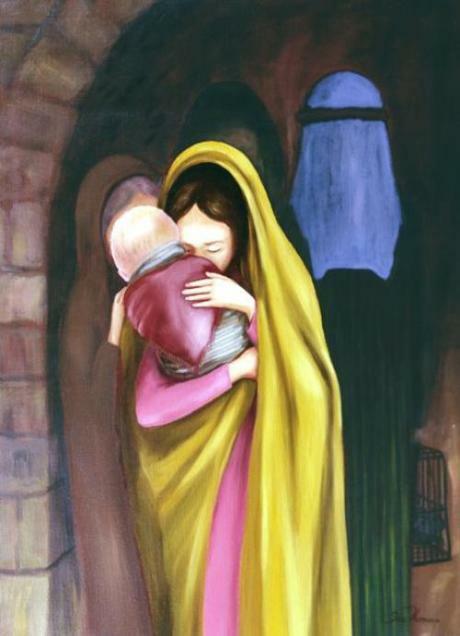 Simeon has prophesied that Jesus “is set for the rise and fall of many,” words that stab Mary in the heart. (A heart is painted in the wrapping of Jesus). Is it the pain that her child must face or is it that many will fall that disturbs her most? Jesus’ presentation does not mean the rise of many while leaving the rest where they are. Instead, by refusing to rise with Him, the rest will fall. It is like the only thing we really possess, our free will. By not choosing with it what is good, we have thus chosen what is not good, evil. The great value of the gift necessarily causes an insult by its refusal.